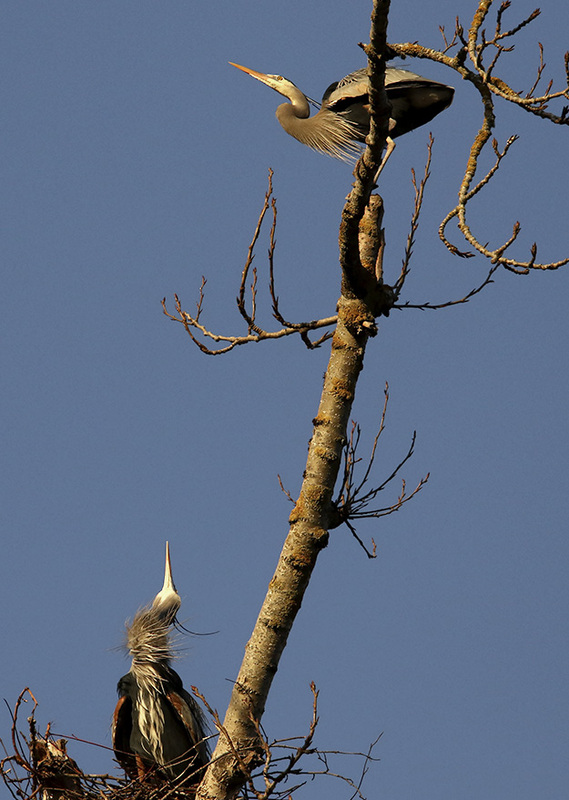 The blue herons have returned to the rookery (the place where they breed and raise their young). Upon my first visit, I counted ten in total. Some were in or near the nests, others were perched at the tops of trees. At present, there are four nests. Only three of them were occupied throughout the entire season last year. 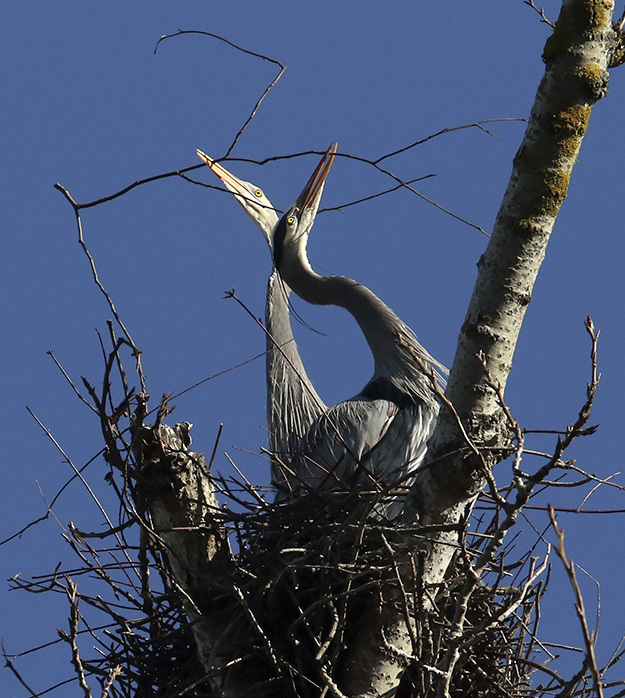 There was a heron in one of the nests for awhile, but one day she flew away never to return. 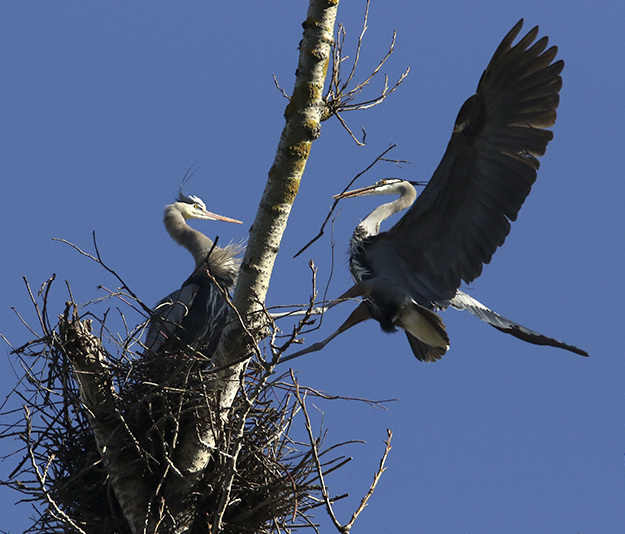 There was also a heron couple constructing a new nest, but they abandoned it before it was completed. Originally there were seven nests, but last year's winter storm tore icy limbs from the trees and sent several of them tumbling to the ground. Only two of those seven nests remain. 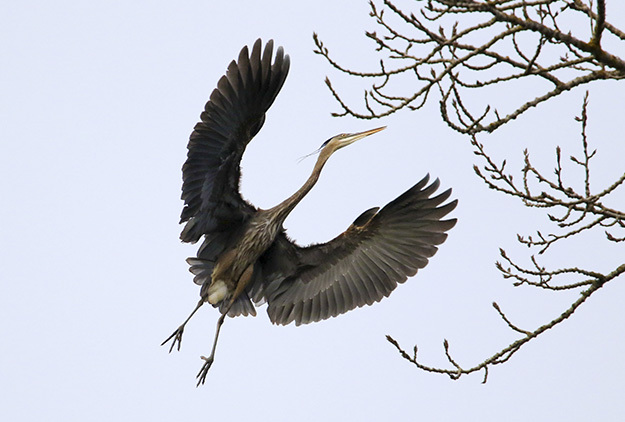 I watched two new nests being created last year, an exquisite cooperation between the heron couple. The male flies off in search of twigs that he brings back to the female, which she weaves together to create the nest. Each season new twigs are added to the previous years nest for extra fortification, and likely as an essential part of the courtship ritual, given affection (and sometimes mating) occurs when a twig is given, a sort of celebration, it would seem. 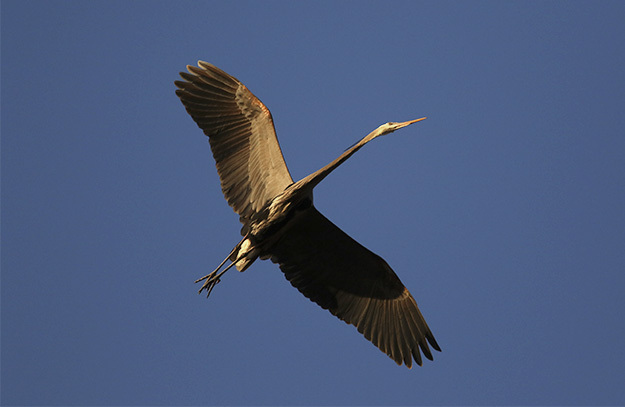 A few days ago I watched one of the male herons fly away five times, returning a few moments later with a twig. He handed it off to his mate who enthusiastically retrieved it and began working it into the nest, while he playfully nudged her back with his beak. A few moments later, off he flew again, in search of another twig. Each time she greeted him with brand new enthusiasm, with outstretched neck as he neared the nest. When I saw them working on their nest again a few days later, I watched as the twigs were being appropriated from a nearby nest that was vacant at the moment. I've witnessed this crafty phenomenon before, though it is not an easy theft given how tightly the twigs are woven together. I am not sure if it's done for 'convenience' sake, or there is some hierarchical behavior involved. There also seems to be some territorial behavior going on, with herons being chased from nests. 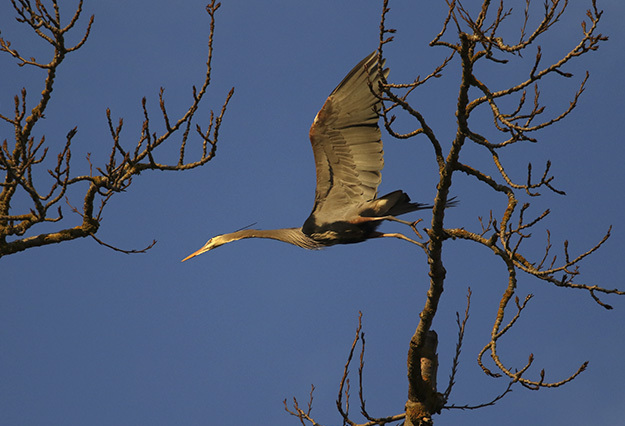 As the mid-February sun was setting over the rookery, I watched a heron (who I am assuming was male) alight from a branch, and fly overhead making a complete circle back to where it had been perched. He repeated this over and over while the heron in the nest directly below (who I'm guessing was female) was making overtures, stretching skyward to where he sat. He appeared to take no notice of her multiple displays, maybe because of the two other herons that were sitting in close proximity in the same tree. Perhaps all three were vying for her attention, a determination of who would make the best mate, who be best suited for the task of raising young. The cottonwood trees at the rookery have many stories to tell. Posted in Uncategorized on February 21, 2018 by barbara.